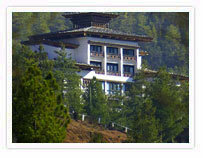 Uma Paro opened in 2004 as Bhutan's first Retreat resort. Located on a 38-acre hilltop close to Paro town, Uma is dedicated to COMO Hotels and Resorts understated philosophy of quiet comfort in culturally rich locations. COMO Hotels and Resorts are defined by high sense of style and design, holistic wellness, gourmet cuisine and individuality. COMO values grace and service, learnt from the East, where the company was born. Uma Paro embraces its Asian roots and it's Himalayan location - visible in its architecture and design as well as guest service and cusisine. 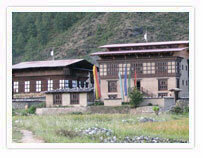 Uma's gourmet restaurant aptly named "Bukhari" has been praised as one of the best eateries in Bhutan. Menus are healthful and change seasonally. Guests have the opportunity to choose from menus offering a selection of Indian, Bhutanese and international cuisine. 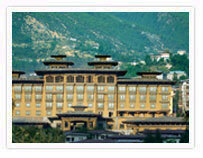 Uma Paro is a place of peaceful serenity, where holistic wellbeing is at the centre of the experience. The COMO Shambala Retreat promises Asian-inspired therapies including the signature COMO Shambala Massage, traditional Bhutanese Hot Stone Bath, and world-class Yoga tuition. Uma residents are all welcome to join the complimentary daily Yoga instruction, whichtakes daily at Uma's panoramic Yoga studio. Throughout the year, visiting Yoga masters lead retreat weeks at Uma, which are open for participants of all levels. For some amusement within the confines of Uma Paro's 38 acres, guests can also try hand at the ancient art of archery on resort's own archery ground. The 45-room Zhiwa Ling combines the sensibilities of a fine Bhutanese guesthouse with the best of 21st Century technology. Envisioned and created by a local Bhutanese company, the hotel's elaborate hand-carved wooden cornices and zhiwaling hotel paromasterful stonework coexist beautifully with today's cutting-edge technology. The spa offers all the amenities of a modern fitness center - sauna, steam room, gym - as well as a traditional Bhutanese outdoor hot-stone bath. The hotel located amidst beautiful landscape and evergreen forest houses fully equipped business center, a tea house, two fully-equipped conference rooms, a meditation house and multi cuisine restaurant. Honoring the spiritual heritage of this ancient Buddhist kingdom, a temple has been built into the second floor of the hotel, made with 450-year-old timbers from the famous Gangtey Monastery, the crowning glory of this new ten-acre cultural landmark. Inspired by the lifestyle and rich culture of Bhutanese people, Village Lodge is admirably constructed in true Bhutanese essence. Located only a few minutes drive from Paro airport and set on the fertile farmland in the middle of vibrant Paro the village Lodge Paro Bhutanvalley encircled by richly forested hills, the lodge offers exquisite traditional experience and luxurious accommodation in a peaceful Himalayan environment. Their truly ethnic hospitality bestowed on each guests is one of its kind and is unmatched in entire Bhutanese hospitality industry. In an endeavor to preserve the true essence of our theme based lodge we have constructed limited number of guest rooms so we could give personalized attention to each of our valued guest. You are most welcome to venture into our kitchen to learn the art of Bhutanese culinary or simply watch their expert Chef prepare Chili Cheese Ema datshi, the fiery Bhutanese delicacy. A well stocked bar (Never Underestimate the Spirit acronym NUTS) with imported and local beverages is the place you would sure be looking for to unwind after your tiring hike to Taktsang monastery, the Tiger's nest located on the cleft of the lofty cliff. 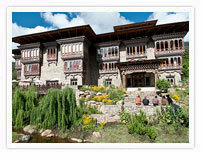 Dining in their restaurant is another exceptional treat you can ever get in entire Bhutan. You can savour their local set dinner or continental delicacies either in open air or in their traditionally decorated restaurant. Nine suite rooms elegantly decorated in Bhutanese architecture are equipped with underground heating system with bath tub and bathroom. NUTS Bar offers the selection of international and Bhutanese beverages. Nestled right in the heart of the Thimpu valley of magical Kingdom of Bhutan, the Taj Tashi hotel Taj Tashi Thimphu Bhutanis the perfect blend of Bhutanese traditional and modern architecture. Surrounded by awe-inspiring Himalayan vistas the ultra modern hotel offers several categories of luxury accommodation. Elegantly adorned with classical hand-drawn Buddhist murals, its guestrooms and suits incorporate the region's traditional art and colours. Each room offers mesmerizing views of the glistening Himalayan peaks towering above Thimpu valley. The Taj Tashi not only offers highly comfortable accommodation in perfectly blissful environment but also serves traditional, Asian as well as continental cuisines. Enjoy Chili Cheese Ema datshi, the fiery Bhutanese delicacy at hotel's traditional themed restaurant or simply relax at Rims, the airy tea lounge or sip on a drink at the hotel's bar, Ara or simply pamper yourself in their exclusive spa or heated indoor pool. Taj Tashi can be made the ideal base to explore the tiny kingdom's mystical ancient monasteries, witness centuries-old colourful festivals, spectacular high mountain passes and pristine wilderness of Eastern Himalayas. 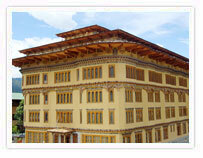 Accommodation Spacious, luxuriously appointed rooms blended with Bhutanese art and architecture in a modern setting. The rooms offer exquisite views of the mountains and the township. All day dining, multi-cuisine restaurant serving Continental and Asian delicacies. The 'Rimps' - the tea lounge, serving a choice selection of teas and coffee complemented by an assortment of confectionery offerings. The Taj Spa is equipped with single and double treatment suites. Guests can indulge in Indian holistic and signature treatments, specially designed to maintain physical, mental and spiritual equilibrium in life. Fitness center Conference and Banquet Facilities A 2700 square feet conference hall with a capacity of 300 guests in theatre style and 150 guests in sit-down style seating. Namgay Heritage Hotel is built on the concept that tourists experience the culture, history and Bhutanese way of life in best possible manner and style suited to their sensibilities. The hotel genuinely reflects the culture and traditions of Bhutan and at the same time offers amenities of a truly modern hotel. Each of the Namgay Heritage Hotel room are unique and equipped with requisite amenities like large queen size or two standard beds, two piece sofa set, Cable TV, Mini Bar, Wi Fi Internet connection, tea / coffee maker. The Continental restaurant here provides all day dining services with a good selection of continental and Indian cuisine. The hotel also has a specialized Bhutanese restaurant, offering local cuisine from all parts of the country and a strong brand of Ara (local Spirit). "Chang-Khu", the hotel's bar with a large selection of local and international beverages, in its own roof shed of wooden shingles and huge wooden pillars and bamboo thatch walls, is almost a separate house, resulting in unique ambience quite apart from rest of the hotel. The hotel also offers both a banquet hall with full catering services and a large conference hall able to accommodate more than 200 person, in theatre style and up to 50 persons in round table style. The conference room is also equipped with state of the art audio system and a VIP room. Hotel's gym appeala to both serious body builders and casual health conscious people. There is separate salon for ladies and gents and a spa with trained masseuse offering various kind of massages and equipped with steam and sauna.